Video footage of a woman attacking a man in Doncaster has gone viral. The mobile phone footage of the incident in Bank Street, Mexborough, on Wednesday night, has been shared thousands of times on social media. 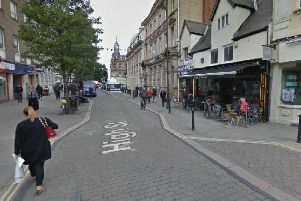 Filmed by a teenage schoolboy, the footage shows a woman stopping a car in the middle of Bank Street to block its path. She is then seen climbing onto the bonnet. When she climbs down she then stops another car and pulls its windscreen wipers up. The driver of the second car is seen getting out and questioning the woman about her behaviour. A scuffle follows and the woman can then be seen punching the man’s head. Members of the public then intervene but as the driver tries to get back into his car the woman returns and slams the car door into him. She is then seen kicking the door. A police investigation into the incident is underway after it was reported to the force. Officers have also viewed the mobile phone footage.